Our caravan and motorhome customers continue to go paperless with their insurance policies – helping us to raise more and more money for national charity, Heart Research UK. 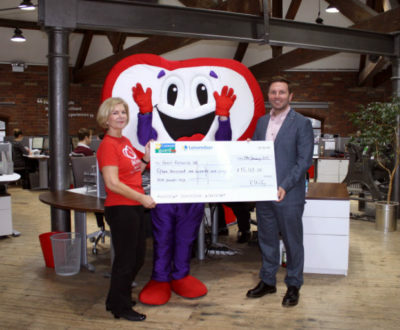 Managing Director of Caravan Guard, Ryan Wilby, presented the charity with a cheque for £15,163 during our annual Healthy Heart day. And staff celebrated smashing their fundraising target by singing for their hearts in a karaoke contest. 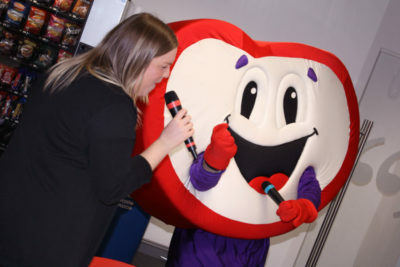 There was also a special visit from the charity’s mascot Hartley, as Heart Research UK delivered healthy heart checks and lifestyle advice to individual staff. Caravan Guard’s Paperless Policies initiative has raised a hearty £62,908 in the last eight years. We donate £1 to the charity every time a customer chooses to receive their insurance documents by email rather than in the post. Ryan gave this year’s donation to a thrilled Hartley and thanked customers and their staff for helping the company smash its fundraising target. The money will help to prevent and treat heart disease across the UK by funding the charity’s work. 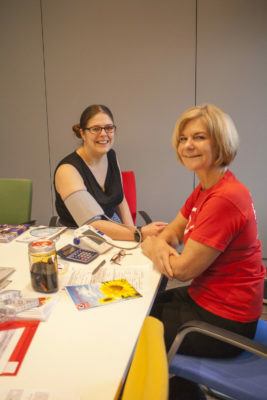 Heart Research have even more reason to celebrate this year as they mark 50 years of helping hearts. Heart Research UK CEO, Barbara Harpham, said: “Caravan Guard has done us proud again. Their very generous donation will be used in our 50th anniversary year, in Yorkshire, to pay for medical research into the prevention, treatment and cure of heart disease and helping hearts for many years to come. Caravan Guard is committed to supporting a number of local and national charities to help make a difference to the lives of others. Their contact centre staff will continue to encourage more customers to receive paperless policies so they can help even more hearts in 2017. Visit www.caravanguard.co.uk or call 01422 396 769 to buy your paperless policy.